The Peg Fassett Studio at the Wyoming County Cultural Center is one of several venues around Tunkhannock that members of the Breaking Ground Poets (above) have found a welcoming home away from home. 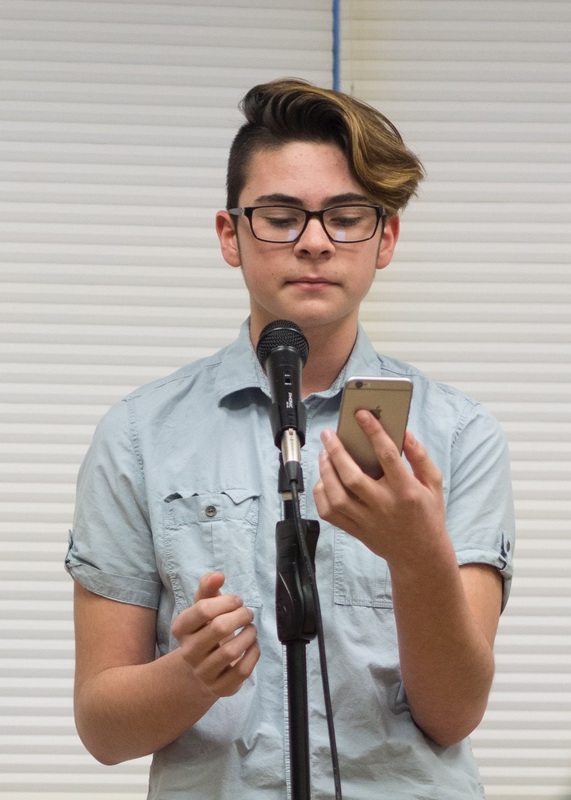 Some high school students have a tougher time than others when it comes expressing themselves. Often they are simply lacking of a receptive audience. 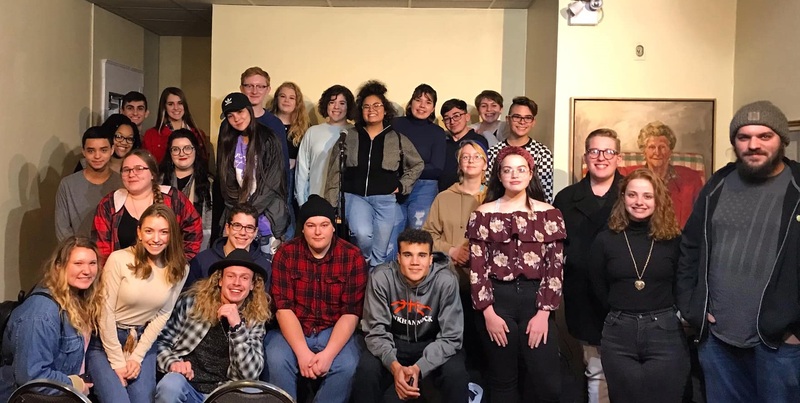 In 2010, Tunkhannock Area High School teacher Katie Wisnoski formed Breaking Ground Poets (BGP) to provide an outlet and support for teens struggling with family issues, bullying, racism, sexism, depression and addiction. The latter is often not their personal struggle but that of a family member or other loved one. Hence, about a handful of students and eventually as many as 20 started meeting regularly for writing sessions, workshops, and open mic nights where they found themselves surrounded by their true peers. 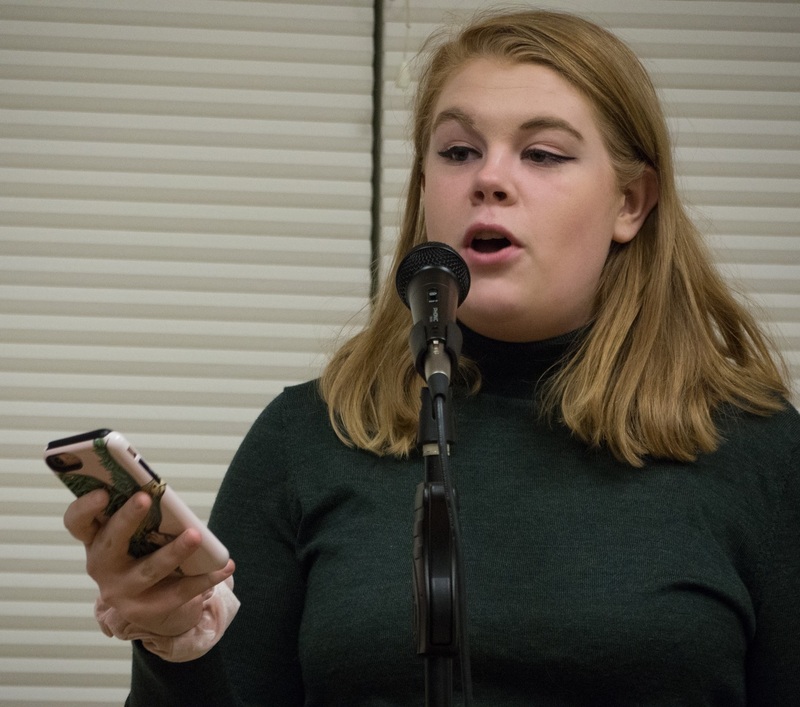 As their confidence and talent grew under Wisnoski’s guidance and constructive criticism from their peers, the BGB started hosting poetry slams, friendly competitions where the combination of their literary skills and vocal deliveries are judged on the spot by a panel. 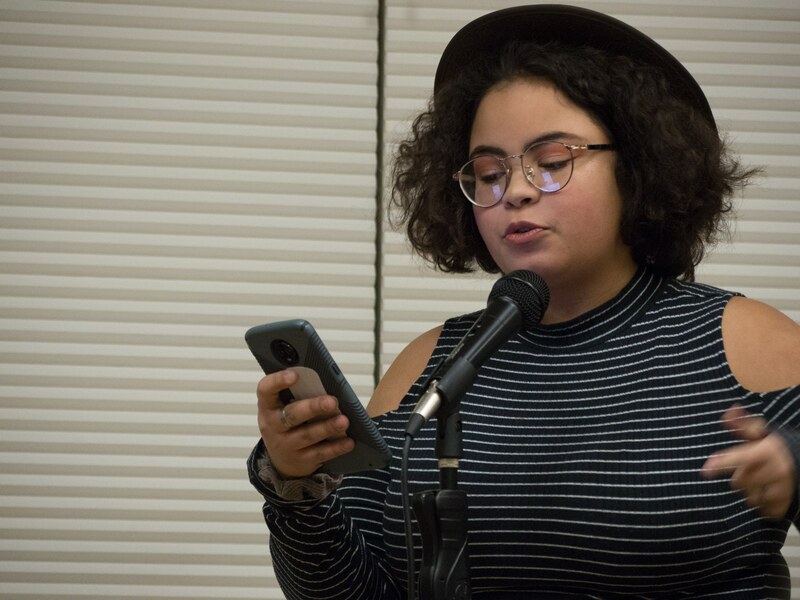 BGP participants can now be seen on Youtube and also take part in national competitions, qualifying for the annual Brave New Voices (BNV) Youth Poetry Slam Festival for the past six years and placing in the top 20 alongside clubs from Philadelphia and New York City. 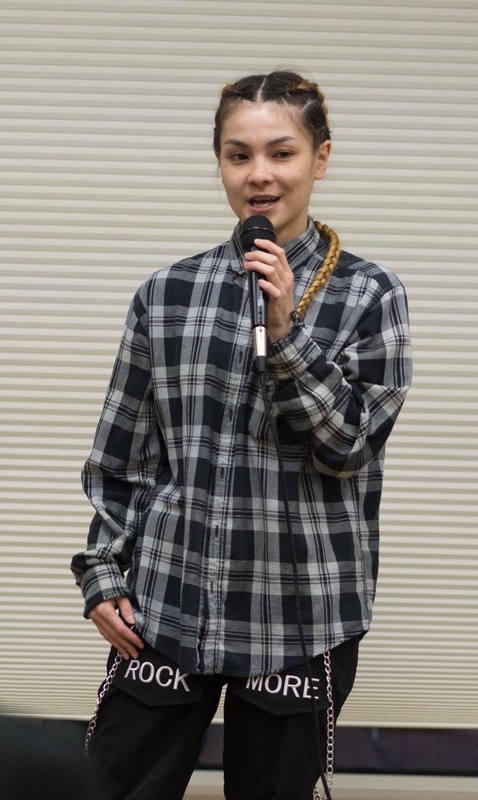 Member Georgia Sherry first got involved with BGP to choreograph their poems for a BNV event in 2015, following them to Atlanta as part of an entourage. “I was really inspired by hearing truths and stories from all over the world,” she explained. Soon after, Georgia (above) began writing poetry too and started reciting her pieces in front of the group. She found BGP to be a safe haven, offering a sense of family, love and light. The group attracts attention where ever they go. Wisnosky was quoted in an article about the Breaking Ground Poets that appeared in a February Woman’s Day Magazine article. The first two poetry slams of the year were held at the Tunkhannock Public Library, and a third one is slated for 5 to 8 pm at the Everhart Museum of Natural History in Scranton on Saturday, April 6. Monthly open mic events are generally held at the Dietrich Theater in Tunkhannock. The schedules for both are posted on the group’s Facebook page. Georgia served as emcee of the February event, providing encouragement for people whom she hopes to keep close to her heart forever. “We are here to build up you and your creativity,” she said of her participation in such events. 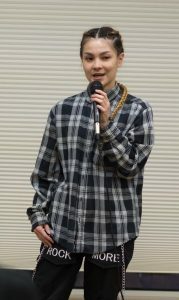 “I hope they gain as much, if not more growth from it than I did.” Georgia added that she is inspired by the continued evolution of the group. CeeJay Appel was a finalists at both the February and March events. In February, his plaintive pieces confronted personal relationships. 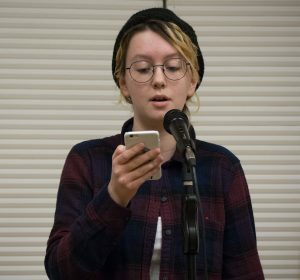 Rosie Culver’s poems offer blunt criticism of racism and sexism from a uniquely teenage perspective.